And then went down to the ship: Vae victis! Ao horror dos campos de concentração nazis junta-se agora a vergonha escondida do que sucedeu depois, do lado dos "bondosos" Aliados. Liberta das mordaças ideológicas a História começa a emergir, como se o sangue enterrado alagasse agora os campos da consciência, emergindo da vala comum do esquecimento. Tal como quando se denunciaram os horrores do nazismo e do estalinismo muitos dirão que é mentira, outros que no tempo em que tudo sucedeu não havia outra alternativa. Ai dos vencidos! 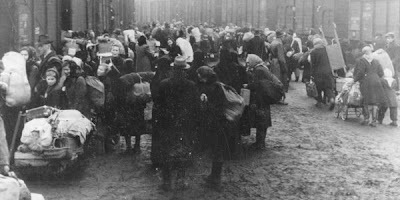 «Most disturbingly of all, tens of thousands perished as a result of ill treatment while being used as slave labor (or, in the Allies' cynical formulation, "reparations in kind") in a vast network of camps extending across central and southeastern Europe—many of which, like Auschwitz I and Theresienstadt, were former German concentration camps kept in operation for years after the war. As Sir John Colville, formerly Winston Churchill's private secretary, told his colleagues in the British Foreign Office in 1946, it was clear that "concentration camps and all they stand for did not come to an end with the defeat of Germany." Ironically, no more than 100 or so miles away from the camps being put to this new use, the surviving Nazi leaders were being tried by the Allies in the courtroom at Nuremberg on a bill of indictment that listed "deportation and other inhumane acts committed against any civilian population" under the heading of "crimes against humanity."». Este blog arquiva o que de interessante li, no plano cultural, em lugares tão diversos que é como se uma viagem me transportasse a outros mundos.